You never want to get on the Internal Revenue Service’s bad side. When you file your taxes late or you claim some huge deductions, your tax file is bound to be red flagged. 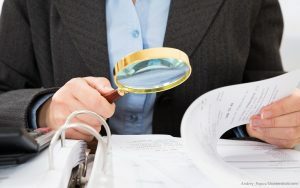 When there are any types of questions about your filing, there’s a good chance that you’ll be audited. Tax audits can be your worst nightmare. If they don’t end in your favor, the IRS might place liens on your property or levies on your balances. If you’ve just learned that you’re getting audited, here are four steps that you need to take. You have to pass what’s called the “smell test” when you’re filing a return, especially if you have reported self-employment income. Since it’s easier for self-employed filers to make deductions that might not be in line with their income, certain returns will trigger an audit. Avoiding financial pitfalls after an audit actually starts before the return is even filed. It’s important that you avoid taking excessive deductions that don’t make sense for the industry that you work in. If it’s hard for the examiner to make sense of all of your deductions that help lower your tax liability, you’ll have to answer for them. Fortunately, many people don’t know that they don’t always need seven years of canceled checks or bank statements to support their filing. If you can substantiate items on the tax return by reconstructing documents or by giving oral testimony, this is an option. Make sure to prepare that testimony so that you can explain your write-offs. It’s not out of the ordinary for an IRS auditor to ask you for your bank statements. How you handle the balances in these accounts could be a major cause for concern. If the agent asks for your statements and you’ve been depositing more in your bank than the income that’s been reported, or if you suddenly withdraw all of your cash from your accounts and it turns up missing, it could not bode well for you. Keep track of deposits and don’t make sketchy withdrawals. If you know tax law in and out, you might not have any issues providing a file of all of the documentation that the tax auditor needs. Unfortunately, unless you’re an accountant or a lawyer, you probably don’t know tax law like the pros. It’s easier for you to retain an attorney from places like Strauss Troy who will help you construct a complete file full of what the IRS needs for the audit to go in your favor. Be sure to choose a reputable law firm with CPAs, practitioners, and agents specializing in tax controversy so you can position yourself for success. If you missed some of your income on your filing, the automatic under-reporting software system will catch it. The IRS will then penalize you for the mistake. That penalty can really add up. Fortunately, you can protect your finances by asking for the penalties to be waived. They won’t advertise that this is an option, but if there’s reasonable cause or it’s a first-time abatement, you may save thousands by simply asking. Getting audited is any taxpayer’s worst nightmare. You file on-time, you try to stay organized, but one transposed digit could be enough to signal an audit. Make sure you protect your finances and don’t just run away from the issue. With the right help, you can get through an audit with a favorable outcome. What Traits are Buyers Looking for in a Luxury Home?